"Victrola" redirects here. For other uses, see Victrola (disambiguation). The company was founded by engineer Eldridge R. Johnson, who had previously made gramophones to play Emile Berliner's disc records. After a series of legal wranglings between Berliner, Johnson and their former business partners, the two joined to form the Consolidated Talking Machine Co. in order to combine the patents for the record with Johnson's patents improving its fidelity. Victor Talking Machine Co. was incorporated officially in 1901 shortly before agreeing to allow Columbia Records use of its disc record patent. 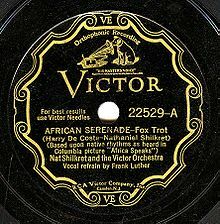 Victor had acquired the Pan-American rights to use the famous trademark of the fox terrier Nipper listening to a gramophone when Berliner and Johnson affiliated their fledgling companies. (See also His Master's Voice.) The original painting was an oil on canvas by Francis Barraud in 1898. Barraud's deceased brother, a London photographer, willed him his estate including his DC-powered Edison-Bell cylinder phonograph with a case of cylinders and his dog Nipper. Barraud's original painting depicts Nipper staring intently into the horn of an Edison-Bell while both sit on a polished wooden surface. The horn on the Edison-Bell machine was black and after a failed attempt at selling the painting to a cylinder record supplier of Edison Phonographs in the UK, a friend of Barraud's suggested that the painting could be brightened up (and possibly made more marketable) by substituting one of the brass-belled horns on display in the window at the new gramophone shop on Maiden Lane. The Gramophone Company in London, was founded and managed by an American, William Barry Owen. Barraud paid a visit with a photograph of the painting and asked to borrow a horn. Owen gave Barraud an entire gramophone and asked him to paint it into the picture, offering to buy the result. On close inspection, the original painting still shows the contours of the Edison-Bell phonograph beneath the paint of the gramophone. Dozens of copies of "His Master's Voice" were painted by Barraud, several of them commissioned for executives of the Gramophone Company and Victor, though Barraud apparently would paint copies for anybody who paid him for one. The original painting is in the archives of EMI Records (successor to the Gramophone company in the UK), now owned by Universal Music Group. 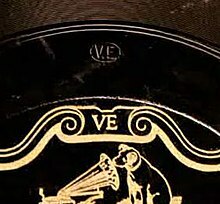 In 1915, the "His Master's Voice" logo was rendered in immense circular leaded-glass windows in the tower of the Victrola cabinet building at Victor's headquarters in Camden, New Jersey. The building still stands today with replica windows installed during RCA's ownership of the plant in its later years. Today, one of the original windows is located at the Smithsonian museum in Washington, D.C. There are different accounts as to how the "Victor" name came about. RCA historian Fred Barnum gives various possible origins of the name in "His Master's Voice" In America, he writes, "One story claims that Johnson considered his first improved Gramophone to be both a scientific and business 'victory.' A second account is that Johnson emerged as the 'Victor' from the lengthy and costly patent litigations involving Berliner and Frank Seaman's Zonophone. A third story is that Johnson's partner, Leon Douglass, derived the word from his wife's name 'Victoria.' Finally, a fourth story is that Johnson took the name from the popular 'Victor' bicycle, which he had admired for its superior engineering. Of these four accounts the first two are the most generally accepted." Perhaps coincidentally, the first use of the Victor title on a letterhead, on March 28, 1901, was only nine weeks after the death of British Queen Victoria. Before 1925, recording was done by the same purely mechanical, non-electronic "acoustical" method used since the invention of the phonograph nearly fifty years earlier. No microphone was involved and there was no means of amplification. The recording machine was essentially an exposed-horn acoustical record player functioning in reverse. One or more funnel-like metal horns was used to concentrate the energy of the airborne sound waves onto a recording diaphragm, which was a thin glass disc about two inches in diameter held in place by rubber gaskets at its perimeter. The sound-vibrated center of the diaphragm was linked to a cutting stylus that was guided across the surface of a very thick wax disc, engraving a sound-modulated groove into its surface. The wax was too soft to be played back even once without seriously damaging it, although test recordings were sometimes made and sacrificed by playing them back immediately. The wax master disc was sent to a processing plant where it was electroplated to create a negative metal "stamper" used to mold or "press" durable replicas of the recording from heated "biscuits" of a shellac-based compound. Although sound quality was gradually improved by a series of small refinements, the process was inherently insensitive. It could only record sources of sound that were very close to the recording horn or very loud, and even then the high-frequency overtones and sibilants necessary for clear, detailed sound reproduction were too feeble to register above the background noise. Resonances in the recording horns and associated components resulted in a characteristic "horn sound" that immediately identifies an acoustical recording to an experienced modern listener and seemed inseparable from "phonograph music" to contemporary listeners. From the start, Victor innovated manufacturing processes and soon rose to preeminence by recording famous performers. In 1903, it instituted a three-step mother-stamper process to produce more stampers than previously possible. After improving the quality of disc records and players, Johnson began an ambitious project to have the most prestigious singers and musicians of the day record for Victor, with exclusive agreements where possible. Even if these artists demanded royalty advances which the company could not hope to make up from the sales of their records, Johnson shrewdly knew that he would get his money's worth in the long run in promotion of the Victor brand name. These new celebrity recordings bore red labels, and were marketed as Red Seal records. For many years, Red Seal records were only available single-sided; not until 1923 did Victor begin offering Red Seals in double-sided form. Countless advertisements were published praising renowned stars of the opera and concert stages and boasting that they recorded only for Victor. As Johnson intended, the majority of the record-buying public assumed from this that Victor Records must be superior. In the company's early years, Victor issued recordings on the Victor, Monarch and De Luxe labels, with the Victor label on 7-inch records, Monarch on 10-inch records and De Luxe on 12-inch records. De Luxe Special 14-inch records were briefly marketed in 1903–1904. In 1905, all labels and sizes were consolidated into the Victor imprint. The Victor recordings made by world-famous tenor Enrico Caruso between 1904 and 1920 were particularly successful. They were often used by retailers to demonstrate Victor phonographs; Caruso's powerful voice and unusual timbre highlighted the best range of audio fidelity of the early audio technology while being minimally affected by its defects. Even people who otherwise never listened to opera often owned a record or two of the great voice of Caruso. Victor recorded numerous classical musicians, including Jascha Heifetz, Fritz Kreisler, Victor Herbert, Ignacy Jan Paderewski and Sergei Rachmaninoff in recordings at its home studios in Camden, New Jersey and in New York. Rachmaninoff, in particular, became one of the first composer-performers to record extensively; he recorded exclusively for Victor from 1920 to 1942. Arturo Toscanini's long association with Victor also began in 1920, with a series of records conducting members of the orchestra of the La Scala Opera House of Milan. He recorded for the company until his retirement in 1954. The first jazz and blues records were recorded by the Victor Talking Machine Company. The Victor Military Band recorded the first recorded blues song, "The Memphis Blues", on July 15, 1914 in Camden, New Jersey. In 1917, The Original Dixieland Jazz Band recorded "Livery Stable Blues", and established jazz as popular music. The advent of radio as a home entertainment medium in the early 1920s presented Victor and the entire record industry with new challenges. Not only was music becoming available over the air free of charge, but a live broadcast made using a high-quality microphone and heard over a high-quality receiver provided clearer, more "natural" sound than a contemporary record. In 1925, Victor switched from the acoustical or mechanical method of recording to the new microphone-based electrical system developed by Western Electric. Victor called its version of the improved fidelity recording process "Orthophonic", and sold a new line of record players, called "Orthophonic Victrolas", scientifically designed to play these improved records. Victor's first electrical recordings were made and issued in the spring of 1925. However, in order to create sufficient catalogs of them to satisfy anticipated demand, and to allow dealers time to liquidate their stocks of acoustical recordings, Victor and its rival, Columbia, agreed to keep secret from the public, until near the end of 1925, the fact that they were making the new electrical recordings which offered a vast improvement over the ones currently available. Then, with a large advertising campaign, Victor openly announced the new technology and introduced its Orthophonic Victrolas on "Victor Day", November 2, 1925. Victor's first commercial electrical recording was made at the company's Camden, New Jersey studios on February 26, 1925. A group of eight popular Victor artists, Billy Murray, Frank Banta, Henry Burr, Albert Campbell, Frank Croxton, John Meyer, Monroe Silver, and Rudy Wiedoeft gathered to record "A Miniature Concert". Several takes were recorded by the old acoustical process, then additional takes were recorded electrically for test purposes. The electrical recordings turned out well, and Victor issued the results that summer as the two sides of 12-inch 78 rpm record Victor 35753. Victor quickly recorded the Philadelphia Orchestra conducted by Stokowski in a series at its Camden, New Jersey studios and then in Philadelphia's Academy of Music. Among Stokowski's first electrical recordings were performances of Danse Macabre by Camille Saint-Saëns and Marche Slave by Pyotr Ilyich Tchaikovsky. Frederick Stock and the Chicago Symphony Orchestra made a series of recordings for Victor, beginning in 1925, first in Victor's Chicago studios and then in Orchestra Hall. The San Francisco Symphony Orchestra conducted by Alfred Hertz made a few acoustical recordings early in 1925, then switched to electrical recordings in Oakland and San Francisco, California, continuing until 1928. Within a few years, Serge Koussevitzky began a long series of recordings with the Boston Symphony Orchestra in Boston's Symphony Hall. Toscanini made his first Victor electrical recordings with the New York Philharmonic Orchestra in 1929. The origins of country music as we know it today can be traced to two seminal influences and a remarkable coincidence. Jimmie Rodgers and the Carter Family are considered the founders of country music and their songs were first captured at an historic recording session in Bristol, Tennessee (also known as the Bristol Sessions) on August 1, 1927, where Ralph Peer was the talent scout and recording engineer for Victor. Victor and its executives became extremely wealthy by the 1920s and in doing so were able to establish markets outside of the original Camden, NJ base of operations. Having established a hand-shake agreement with Emile Berliner in forming Victor Talking Machine Co, Berliner was sent from the U.S to manage the remaining holdings of the Gramophone Company (a company in which Victor owned a significant portion in part due to patent pooling agreements, and Victor's success in its first two decades). Eventually, this meant that Victor (in addition to owning studios, offices, and plants in Camden, New York City, Los Angeles, Oakland, Chicago, South America) also owned controlling interests in the Gramophone Company of Canada and England, as well as the Deutsche Gramophone Co. in Europe. Soon, Victor formed the Victor Company of Japan (JVC), founded in 1927. As Radio Corporation of America acquired Victor, the Gramophone Co. in England became EMI giving RCA a controlling interest in JVC, Columbia (UK), and EMI. During World War II, JVC severed its ties to RCA Victor and today remains one of the oldest and most successful Japanese record labels as well as an electronics giant. Meanwhile, RCA sold its remaining shares in EMI during this time. Today the "His Master's Voice" trademark in music is split amongst several companies including JVC (in Japan), HMV (in the UK), and RCA (in the US). Victor kept meticulous written records of all of its recordings. The files cover the period 1903 to 1958 (thus including the RCA Victor era, as well as the Victor Talking Machine Co. era). These written records are among the most extensive and important sources of available primary discographic information in the world. There were three main categories of files: a daily log of recordings for each day, a file maintained for each important Victor artist, and a 4"x6" index card file kept in catalog number order. There are about 15,000 daily log pages, each titled "Recording Book," that are numbered chronologically. Each recording was assigned a "matrix number" to identify the recording. When issued, the recording had a "catalog number," almost always different from the matrix number, on the record label. As of 2010, the remaining pages available at the Victor archives go only up to April 22, 1935. Victor's original pages after this date were apparently discarded or lost at some point. However, Victor's ties with EMI in England, and at Hayes, Hillingdon, in London, EMI has more recent pages. These pages were sent at the time they were first written and therefore do not have the annotations made afterwards. Most, but not all, daily log information for recordings made for synchronization with motion pictures were kept separately, and the separate synchronization recording information is missing from the Victor archives. Victor also issued annual catalogs of all available recordings with monthly supplements announcing the release of new and forthcoming records issued throughout the year. These publications were carefully prepared and were lavishly illustrated with many photographs and advertisements of popular Victor recording artists. The Encyclopedic Discography of Victor Recordings (EDVR) is a continuation of a project of Ted Fagan and William Moran to make a complete discography of all Victor recordings. The Victor archive files are a major source of information for this project. In 2011, the Library of Congress and Victor catalog owner Sony Music Entertainment launched the National Jukebox offering streaming audio of more than 10,000 pre-1925 recorded works. This made the recordings, much of them not widely available since World War I, available for listening by the general public. In September 1906, Victor introduced a new line of talking machines with the turntable and amplifying horn tucked away inside a wooden cabinet, the horn being completely invisible. This was not done for reasons of audio fidelity, but for visual aesthetics. The intention was to produce a phonograph that looked less like a piece of machinery and more like a piece of furniture. These internal horn machines, trademarked with the name Victrola, were first marketed to the public in September of that year and were an immediate hit. Soon an extensive line of Victrolas was available, ranging from small tabletop models selling for $15, through many sizes and designs of cabinets intended to go with the decor of middle-class homes in the $100 to $250 range, up to $600 Chippendale and Queen Anne-style cabinets of fine wood with gold trim designed to look at home in elegant mansions. 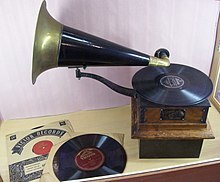 Victrolas became by far the most popular type of home phonograph, and sold in great numbers until the end of the 1920s. RCA Victor continued to market record players under the Victrola name until the late 1960s. Other Victor products included the Electrola (an electrified record player), Radiola (a radio often paired with a record player which was a joint venture with RCA prior to their acquisition of the company), and musical instruments (including the first electronic instrument, the theremin). ^ "RCA Nipper Window on Display at Rutgers". Historiccamdencounty.com. Retrieved 10 January 2018. ^ "Preserving the History of RCA Victor". Historiccamdencounty.com. Retrieved 10 January 2018. ^ "VICTOR 78 RECORDS: Evolution of the Victor Talking Machine Company record labels". Mainspringpress.com. Retrieved 10 January 2018. ^ "Victor matrix B-15065. The Memphis blues / Victor Military Band - Discography of American Historical Recordings". Adp.library.ucsb.edu. Retrieved January 10, 2018. ^ "Victor matrix B-19331. Livery stable blues / Original Dixieland Jazz Band - Discography of American Historical Recordings". Adp.library.ucsb.edu. Retrieved January 10, 2018. ^ Victor Recording Book log, pp. 4761 and 4761A. ^ Suisman, David (May 31, 2009). Selling Sounds. Cambridge, MA and London, England: Harvard University Press. p. 268. ISBN 9780674033375. ^ "Discography of American Historical Recordings - Site - Discography of American Historical Recordings". Victor.library.ucsb.edu. Retrieved 10 January 2018. ^ "Library of Congress, Sony launch streaming 'National Jukebox'". Washingtonpost.com. Retrieved 10 January 2018. ^ "About the National Jukebox - National Jukebox LOC.gov". Loc.gov. Retrieved 10 January 2018. Wikimedia Commons has media related to Victor Talking Machine Company.